Frederick Attridge came to Chelmsford from High Roding via Great Dunmow. As a boy he was a grocer’s errand boy. He served as Territorial from early in the war, and died in the latter stages of the Battle of Somme in October 1916. His parents lived in Wood Street. 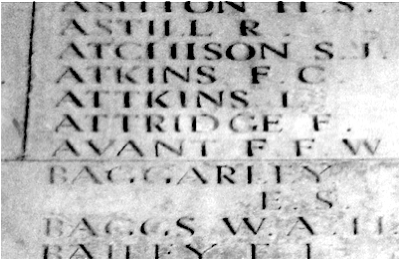 Frederick has no known grave and is commemorated at Thiepval Memorial, near Albert, Somme, France. Frederick is also commemorated on the Civic Centre Memorial, Chelmsford (which records his rank as ‘Private’ and his regiment as ‘Essex Regiment’), and at the London Road Congregational Church, Chelmsford. He is not commemorated by the war memorial at St. John’s Church, Moulsham. Frederick was entitled to the British War Medal and Victory Medal. The 1918 register of electors showed Frederick’s parents living at 12 Wood Street, Chelmsford (renumbered as 47 in 1930), the white house pictured left. 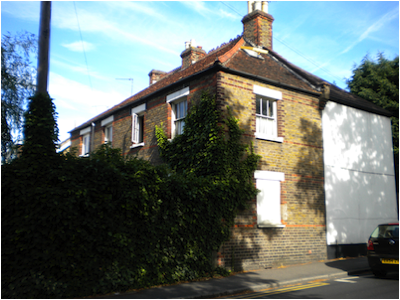 Frederick’s father died in 1947, aged 77 at 6 Wolesley Road; coincidentally one time home of John Harold Cook. His mother died in 1949, aged 79. He was born at High Roding (or High Roothing) in 1897, the son of Charles William Attridge and Alice Phoebe Attridge (nee Day). His father had been born at High Easter in 1869; his mother at Leaden Roding also in 1869. They had married in the summer of 1896. 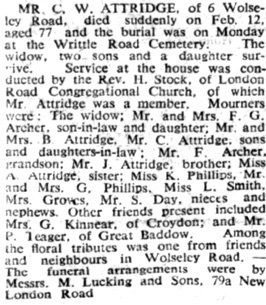 Frederick’s siblings included Bertie Attridge (born in 1899 in High Roding), Lizzie Attridge (born in 1901 in Moreton) and Charles Attridge (born in 1905 in Moreton). The 1901 census found Frederick aged three living with his parents and younger brother at Broadbridge in High Roding. His father was a horseman on a farm. A decade later the 1911 census recorded 13 year-old Frederick living with his parents and three younger siblings at The Ford, Great Dunmow. Frederick was a grocer’s errand boy and his father was a horseman on a farm. Frederick enlisted at Chelmsford, probably in October 1914, initially serving as Private 2635 in the 5th Battalion Essex Regiment, a Territorial battalion. He later served with the 1/9th Battalion of the London Regiment (Queen Victoria's Rifles), which was part of 169th Brigade in the 56th (1st London) Division. The battalion had fought and suffered badly on the opening day of the Battle of the Somme in the diversionary attack on Gommecourt and was involved in heavy fighting throughout the battle as it continued through the summer and into the Autumn of 1916. On 7th October 1916 the battalion moved from reserve trenches south-east of Ginchy into support at Hog’s Back. The following day it moved to the front line at Lesboeufs for and in the afternoon attacked Dewdrop Trench. On 9th October 1916 the battalion moved onto Bernafay Wood, and it was on that day that Frederick was killed in action while serving as Rifleman 392910 (formerly 6629).